Welcome to High Plains Gardening, the gardening information website for the Texas High Plains region and surrounding area! The purpose of this website is to promote a culture of gardening within the Texas High Plains Region by offering detailed, extensive and free information on an easy and successful way to garden. My hope is that many more people will begin to enjoy gardening, and gardening success, in the Texas Panhandle. TV gardening programs that focus on and highlight area gardens, as well as being informational about southwest gardening will air. Suited to our climate and conditions. HighPlainsGardening.com offers more than that. It contains information on successfully growing many native plants, some medium and high water-use plants, including proper turf techniques for our region and a special section of activities you might find a plain old gardener doing month-to-month (Stepping Stones). Check out the Plant Lists for categories of plants such as perenials, shrubs, trees, Southwest evergreens, grasses and others. Garden Notes contains timely horticultural information on a frequent basis. A final article still in development is in creating gardens with our own Texas Panhandle sense of place. I will outline examples of different styles more suggestive of our region that feel more like home, rather than traditional, foreign imports. My name is Angie Hanna, and I’ve been involved with gardening and gardening education for a number of years. I live and garden in the southwest part of Amarillo, Te xas and have for over 30 years. I garden in the city. Country gardening has the added challenge of windier conditions, slightly cooler, than the city. City gardening can be hotter in the summer, but also warmer in the winter. There are advantages and drawbacks wherever you live. Gardening is America’s number one hobby and I’ve found nearly everyone likes to talk about plants and gardening. I’ve visited with many people both inside their gardens and in casual conversation. Even if a person professes to have a black thumb, all enjoy the beauty of foliage and flowers. For me, gardening is a passion, pleasure, and a creative pastime. It’s an outlet to connect and reconnect with nature and let go of stress. Gardening is at times hard work physically, but mentally relaxing. Gardening is fun. Gardening in the Texas Panhandle is easy. Yes, gardening is easy for me, and it should be for you too. I have no formal horticultural credentials to cite as basis for teaching gardening. I'm a graduate of the 1995 Potter-Randall County, TX, Master Gardeners. I have been involved in gardening projects and garden writing for a number of years. I've taught Xeriscape Gardening at Amarillo College through the Leisure Studies Department, with the Master Gardeners, and at the Amarillo Botanical Gardens. During a decade long stint as a master gardener, I was responsible for developing and implementing the Xtreme Gardening class series with the Xtreme Gardening Committee and the Potter-Randall County Master gardeners at the Amarillo Public Library in downtown Amarillo, but now I am just a plain ol’ gardener (pog). I speak, and have spoken for numerous clubs and organizations for over a decade on many gardening topics, including organic gardening, appropriate plants for the Panhandle as well as xeriscape gardening. 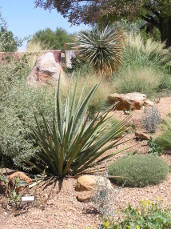 In 2002, my xeriscape garden was filmed by for a short 5 minute video entitled How to Prepare Soil for a Xeriscape Bed for the Southwest Yard and Garden Show, prod uced by New Mexico State University, Las Cruces. In 2008, Skip Mancini of HPPR's Growing on the High Plains, aired a program with an interview of me as part of her Great Gardens series. Memberships have included the Native Plant Society of Texas, Amarillo Chapter, the American Horticultural Society, The Cactus and Succulent Society of America and the Amarillo Botanical Gardens. 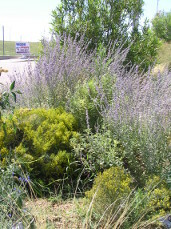 During 2006, I've become an active volunteer at Amarillo Botanical Gardens by designing and implementing the Xeriscape Garden, and the High Desert Garden, featuring plants native to the four deserts of the United States in elevations compatible with our areas climate and conditions. In 2008, I designed and installed the Yellow (Amarillo) Garden at the parking lot entrance. I've been a member of their Grounds oversight committee from 2007 -2016. I also brought my High Plains Gardening (Xeriscape) class, Organic Gardening and Fall/Winter Vegetable Gardening class to the Amarillo Botanical Gardens. I volunteered and worked as the Volunteer Coordinator for four years for Amarillo Botanical Gardens from 2013-2016. You don’t need any special credentials to be a successful gardener. But it doesn’t hurt if you have them. What you do need is information about our area’s climate and conditions, what to plant, how to best use your microclimates and how to amend the soil to increase your plant selection. Water conservation tips are included throughout th e website. Everyday, more information is learned about new plants, better ways to garden, about stimulating the biological life of the soil and the inter connectivity of life. This is not an all inclusive information site, merely a beginning, a starting point. But it does include a great deal of gardening information directly relating to the Texas Panhandle. HighPlainsGardening.com is a work in progress, beginning with the first sections posted and launched in September, 2005. As of the end of January, 2007, the majority of the website was completed. Over the past years, I've added many sections, including a large section of plant profiles, more digital photos and plant lists for our area. And as my time permits, I still hope to add more plant profiles and current information to the website in the Garden Notes section. Technology moves so fast, before I've completed the website, I've already had my son overhaul the format and look of HighPlainsGardening.com in August 2008 with an updated format. 2013 brings yet another upgrade in style and function, along with two new sections, more plant profiles and digital photos. There is always more information to add to it.